What does it mean to be a part of a dysfunctional family? Of course, I admit that ‘dysfunctional’ can be interpreted in many ways, and there is no one broad meaning that applies to every family, as each case should be regarded individually. In this case, talking about a dysfunctional family, I mean the Meyerowitz family – the characters of Noah Baumbach’s recent film. To me, “The Meyerowitz Stories” shows the same piece of brilliance as the director’s 2007 film “Margot at the Wedding”. The family members try to reconnect but continuously fail at it. Yet, we see the love they have for each other, and that’s what helps them to survive some crucial events and overcome an inevitable tragedy. 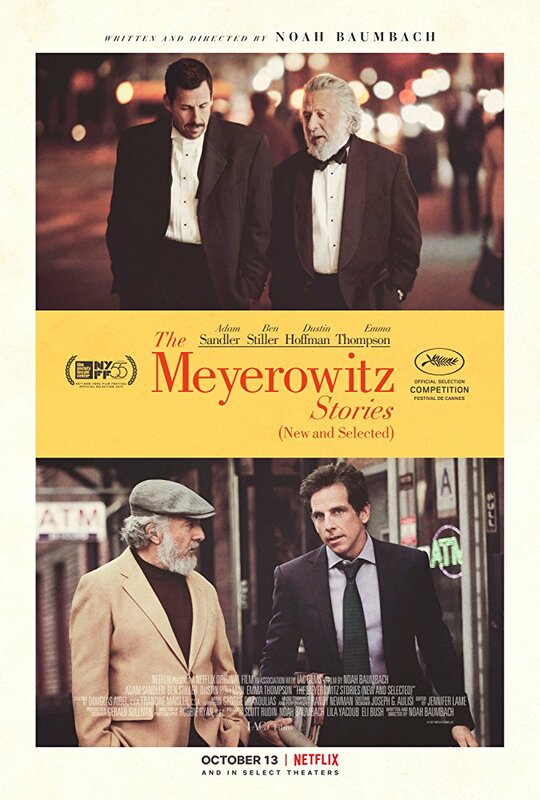 The film tells us the emotional story of the Meyerowitz siblings: Danny (Adam Sandler), Matthew (Ben Stiller), and Jean (Elizabeth Marvel) who, throughout their whole lives, try to free themselves from the shadow of their father Harold (Dustin Hoffman). The three of them do not see each other often and Harold’s hospitalization becomes the reason to bring them back together. As their father battles for his life, another battle takes place in the same hospital between the siblings. In this confrontation, each of them is trying to win the others’ affection, but in a very unusual way. We learn Harold’s story. First, he was married to Danny’s mother. He then left her to marry another woman and became estranged from his son. Harold, as well as his two sons – Danny and Matthew, are very artistic people. Harold is a sculptor, Matthew – a manager in Hollywood, yet, Danny has buried his talent because of one hundred reasons which he will find difficult to list even to himself. As the story unfolds, we learn many details about the Meyerowitz family – their tales and problems that have torn this family apart. But there is something about them you will never stop admiring – how honest, simple and gentle-hearted they are. Even Harold’s wife Maureen (Emma Thomson). She is endlessly patient, and one would wonder where she gets so much courage and patience from. Because, as you will soon realize, Harold is not an easy person to deal with. One does need the courage to love him and stay around him. You’ll also see that due to his vast life experience, he knows how to picture the entire situation in his head even before it happens. In conclusion, there are no ups or downs when it comes to “The Meyerowitz Story”. And how could there be? Noah Baumbach has penned a strong script and then, directing the film, has turned it into a genuine masterpiece in his own specific way. The plot is structured cleverly; the performance of the entire cast is absolutely outstanding. And my very special mention goes to Adam Sandler, who has brought so much depth into Danny’s character and demonstrated a whole new level of acting skills. Overall, this is a sweet family story – dysfunctional, yet heart-warming, and I can say I’ve learned a lot from the film. It is an educational, exciting, and sometimes amusing film. It will cause you lots of laughter, but also leave room for tears. You will just have to wait patiently for that moment, which, for sure, will arrive.